Lets start with good news: there is ONE model indicating a wet storm could impact the Sierra by early next weekend. 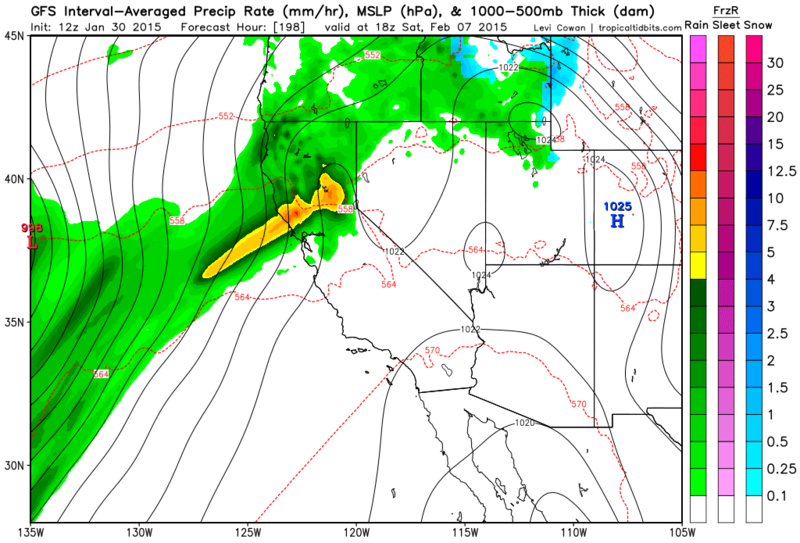 The GFS brings heavy precipitation into NorCal and the northern Sierra by late Friday night (February 6th). The other THREE models that I've looked at keep the main moisture plume to the north to start the weekend. The only reason I'm even posting a 198 hour forecast is because there has been nothing exciting for nearly a month now (over a month?)! The bad news: the figure above shows rain and snow, with nothing but rain in CA (including the Sierra). 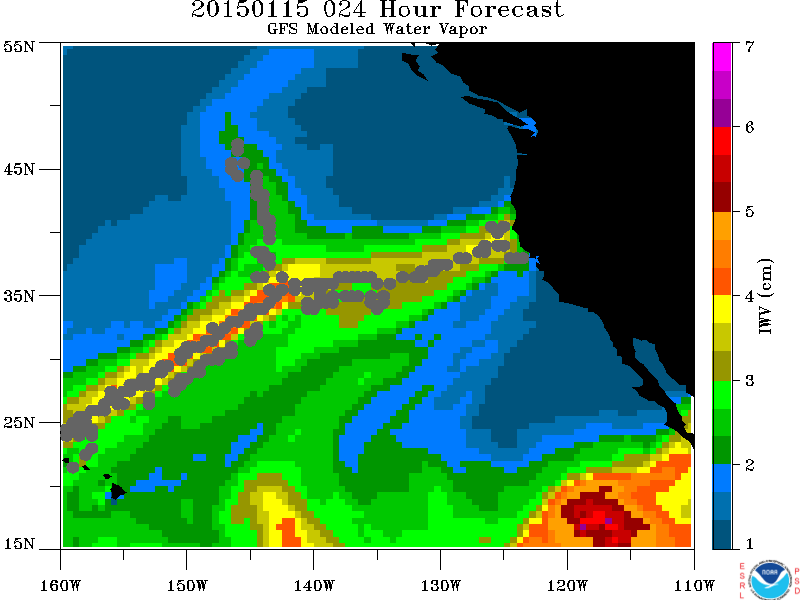 This appears to be an atmospheric river type event, with warm origins (wah wah wah, no bueno). 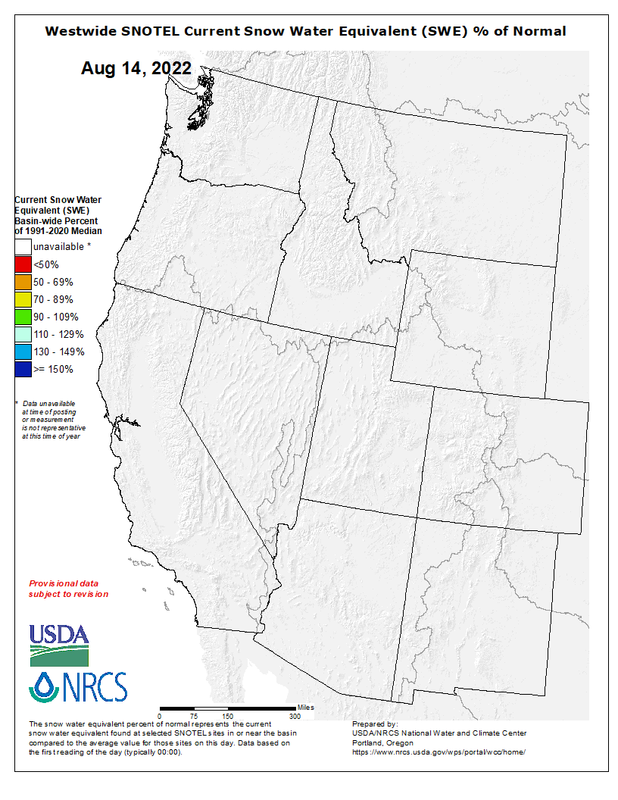 Any liquid is good for CA, but we really need the snowpack. OK, we will just have to wait and see how this plays out next week, because the forecast will undoubtedly change. This weekend into next week will remain balmy and dry in the Sierra, while the northeast is under the gun again with another developing Nor'easter. This is a common pattern when a blocking ridge sets up in the west. 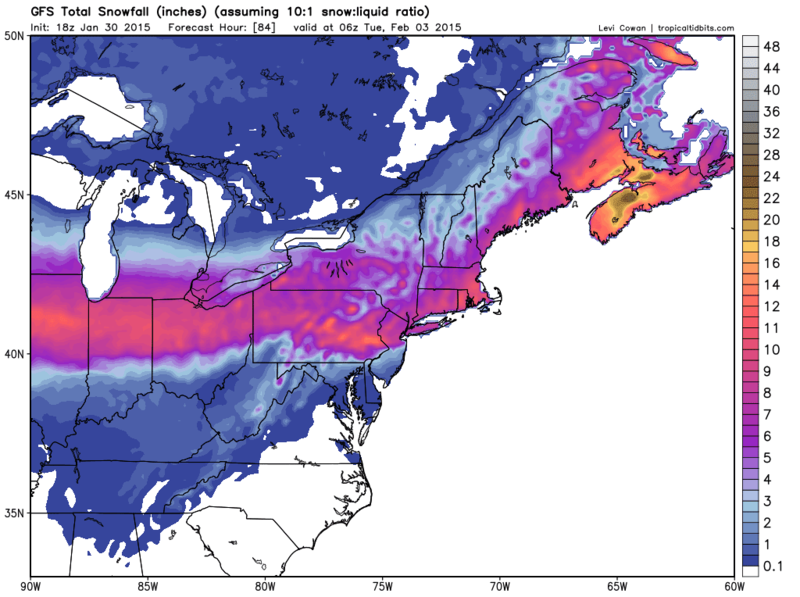 Oh, hey, here is where all our snow is going! Nova Scotia, awesome! This should come as no surprise, but we could expect another mid-winter heat wave by early next week in the west...I wish I had some good news. 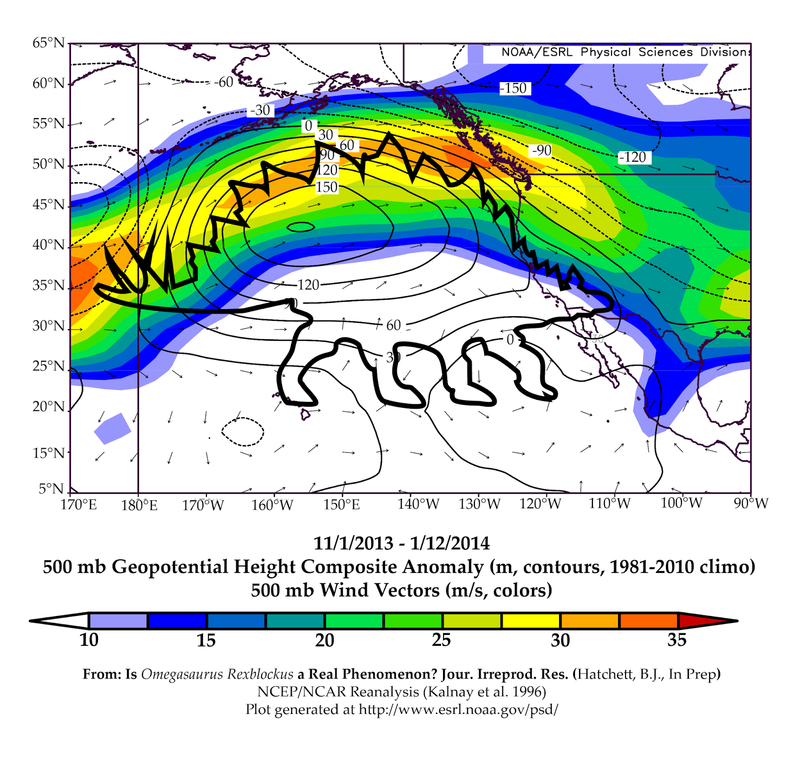 850 hPa represents about 5000 ft. above the surface, or around the elevation of Reno, NV. Maybe for once things will change in our favor by next weekend, and the atmospheric river will couple with cold air from the north (doubt it)! Until then, keep working on your tan and getting in shape for summer activities. A nice little tropical dose over the next 24 hours should dampen the soil and rinse off the tickmarks on your projects. Tropical moisture exports are important components of the planetary circulation. 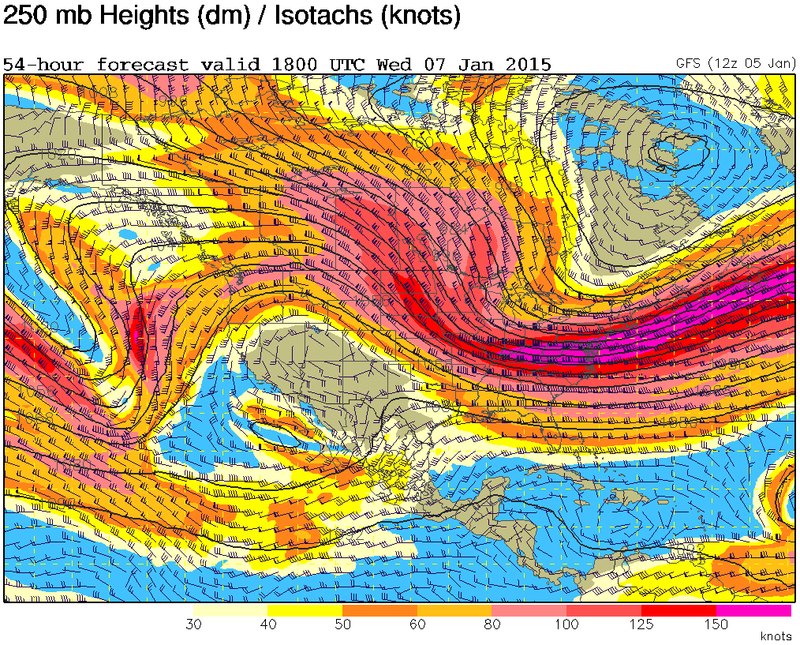 The highly amplified southern stream is contributing to blowing up eastern North America. Between 0.25-0.5 inches of liquid will be welcomed by all living things in the central and southern portions of the Great Basin. Snow will be falling in the higher country with light accumulations. Probably a good weekend to avoid climbing in the southern regions! 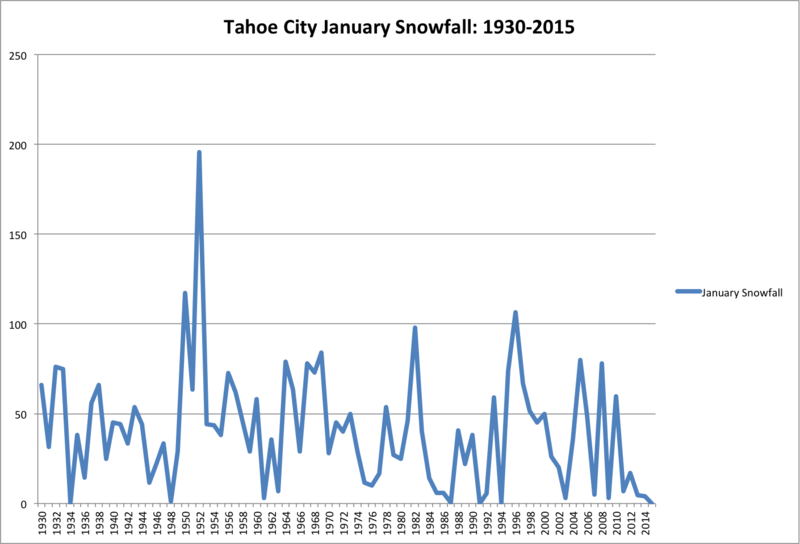 Will it ever snow again in the Sierra? Probably, but not likely in the next 7 days. Omegasaurus (see our last post if you are not familiar with this beast) will continue to dominate our weather pattern in the near future. I'm not going to get into details about the long-range forecast, as we've had our hopes built up just to get let down a few too many times this season. As a graduate student at the Desert Research Institute my main area of research has been drought. So, many of you may be tired of hearing about the current drought, but where this one falls into the last 120 years of records is pretty interesting to a drought nerd like myself! I put together an analysis from the Tahoe City COOP station. 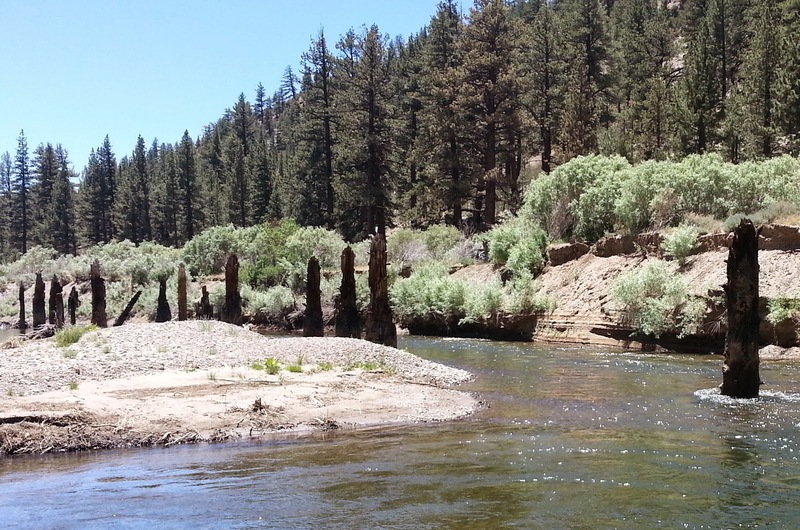 This station is part of the US Historical Climatology Network because it has a long and consistent period of record dating back to the late 1800s. Let me break down this figure for you. In each panel the black line is the same, and shows the water year (September-October) percent of normal precipitation. 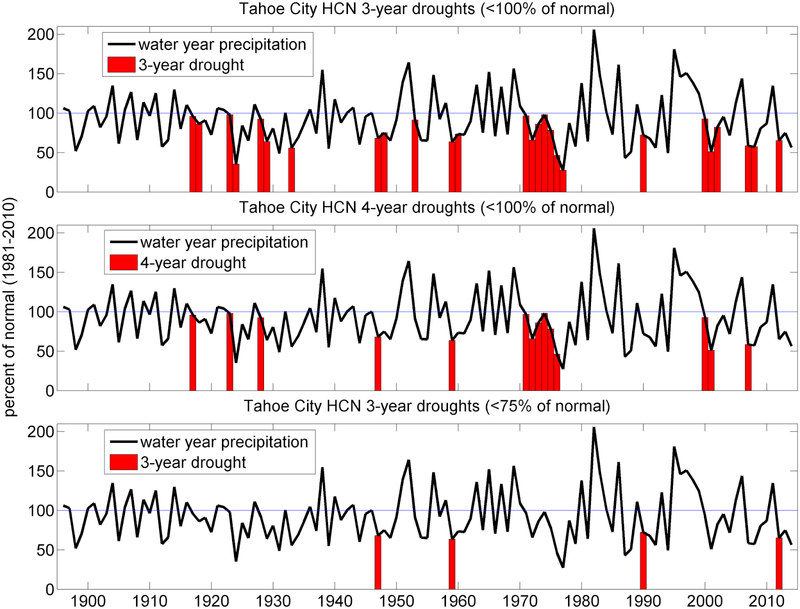 A red bar indicates the start of a drought period. For the top panel a drought is classified as <100% of normal for 3 consecutive years. The middle is same threshold, but for 4 consecutive years, and bottom has a threshold of <75% of normal for 3 consecutive years. There were actually 9 years in a row below normal during the 90's, nearly the entire decade (top panel). 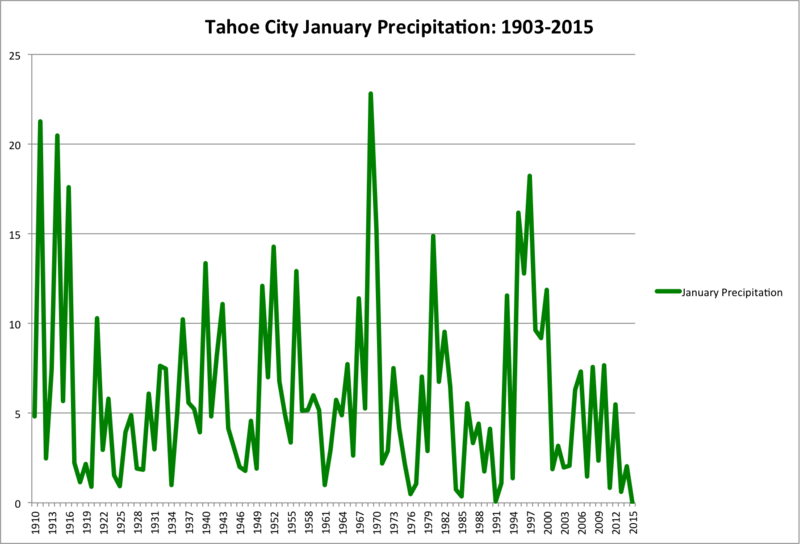 But, a couple of those years were 90-98% of normal, which still a lot of precipitation. Focusing on the bottom panel, there have only been 4 cases since 1896 that have seen 3 years in a row with <75% of normal precipitation (including 2012-2014). At this particular station there has never been 4 years in a row below 75% of normal...lets hope we don't break that record this year! Lets not forget that we have evidence that suggests much drier periods than this one lasting for several decades, as Ben alluded to in the last post. My analysis is based only on one weather station record. Well, I'm off to hit the mountain bike trails in Reno, which are riding pretty awesome right now! Enjoy the weekend, and make the best of what have right now! Conditions are going to continue to be perfect for cool summer activities with a late-week cooling trend as the upper level flow becomes more west-east. The southern PeeEnDub will be the place to be if you are psyched to slide on snow and rocks! Too bad they don't have much of a snowpack! Better to head east but hide those Cali plates. In the ever-so-subtropical Sierra Nevada, keep spinning tires, clipping bolts, SENDING THE DAWN WALL (Congratulations, Tommy and Kevin, for a true opus of a rock climb at the planet's finest venue), and skateboarding. T-shirts for the day, a layer or two on Friday, and a windbreaker for the weekend. Omegasaurus will snooze a bit but otherwise keep things nice and dry. One more key point to make, my dear snow-lovers. 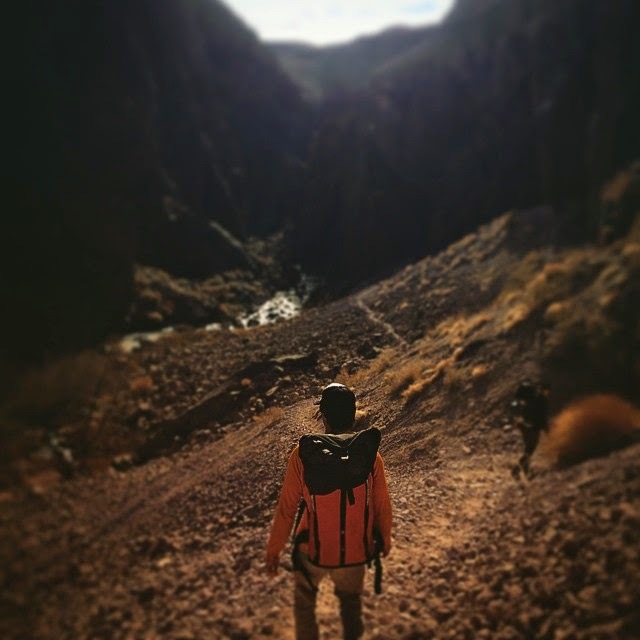 There may not be an end in sight. Not in our lifetime and perhaps not in anyone who will be born during the next 100 years. Stine's Trees silently pass this wisdom on to us. These Jeffery Pines grew for 100-200 years over two separate periods when Baghdad was the place to be. 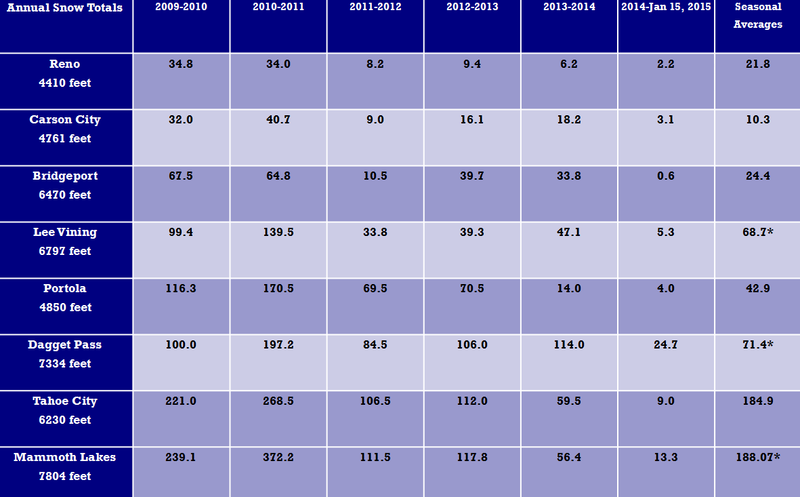 To enable their growth, most of these years had smaller or similar seasonal snowfall totals as the past three years. Behold the power of Omegasaurus! The current longwave pattern for us and the rest of the Country reveals a classic (positive) wintertime Pacific/North American (PNA) signature with a ridge over the Pacific NW and a broad trough over the upper Midwest and Great Lakes region. 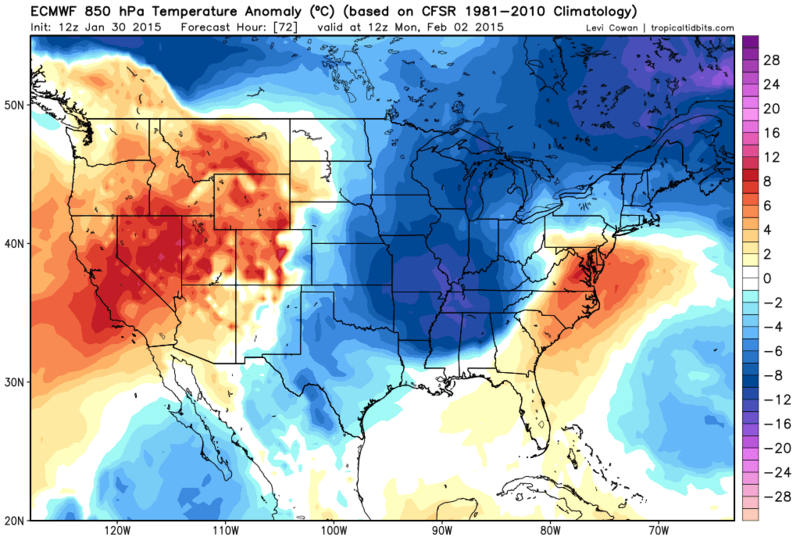 Over the next 24 to 72 hours, this pattern amplifies significantly bringing unseasonably mild temperatures to the West and a healthy bout of Arctic air across the eastern two-thirds of the US (Figure 1). Figure 1. 250 mb (Heights/Winds) GFS model prog illustrating the ridge of steel over the West and a broad trough over the eastern two thirds of the Country. Courtesy of NCAR RAL web page. A positive phase PNA anomaly is quite common for this time of year, particularly the first week or two in January. In general, the prominent weather that ensues with such a pattern is above (below) average temperatures (precipitation) over extreme western Canada/US and the opposite scenario for the central-eastern US. 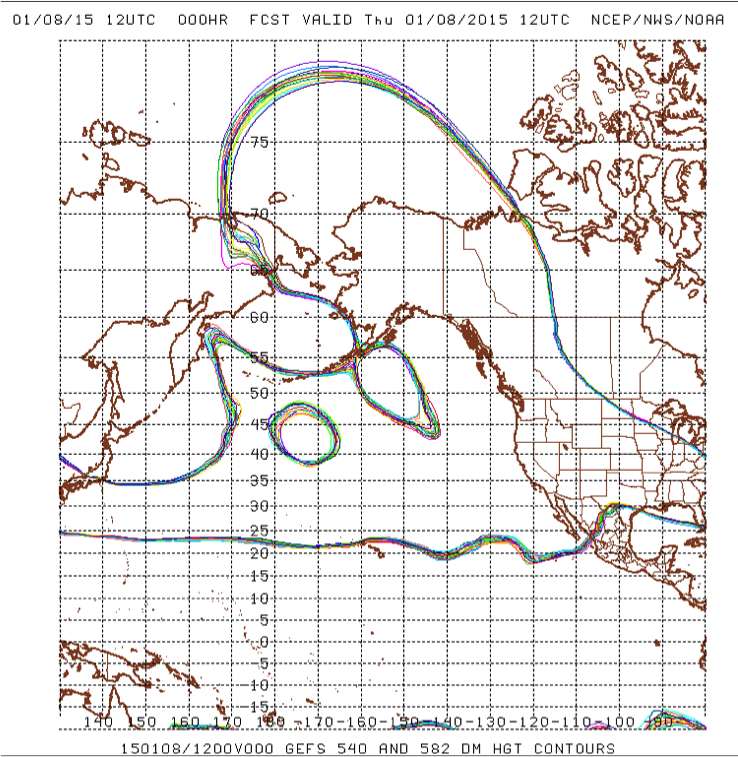 A negative phase PNA anomaly tends to feature the reverse ridge/trough signature over the US. The dynamics of the PNA anomaly are a function of the upstream environment. In large, it is controlled by the sea surface temperature anomalies over the south Pacific (e.g, El Nino/La Nina), which modulate the behavior of the Asian-Pacific jet. The phase duration of the PNA can be persistent or highly variable at times where changes every 7-10 days are not uncommon. Persistence or (high variability) has been linked to stronger (weaker) signals in the El Nino Southern Oscillation (ENSO). 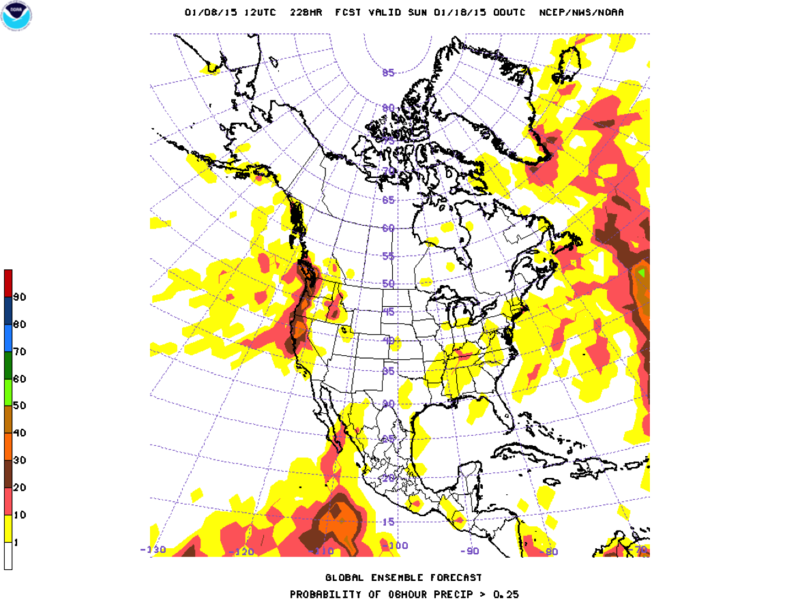 The short term forecast for the PNA anomaly is depicted in Figure 2. As noted in an earlier post, a few weeks back, the current ENSO signal teeters toward weak El Nino. Therefore, we can watch and see if the positive PNA (and the associated ridge of steel) is short lived...let's hope so, or the beast reforms and drives us crazy. Figure 2. 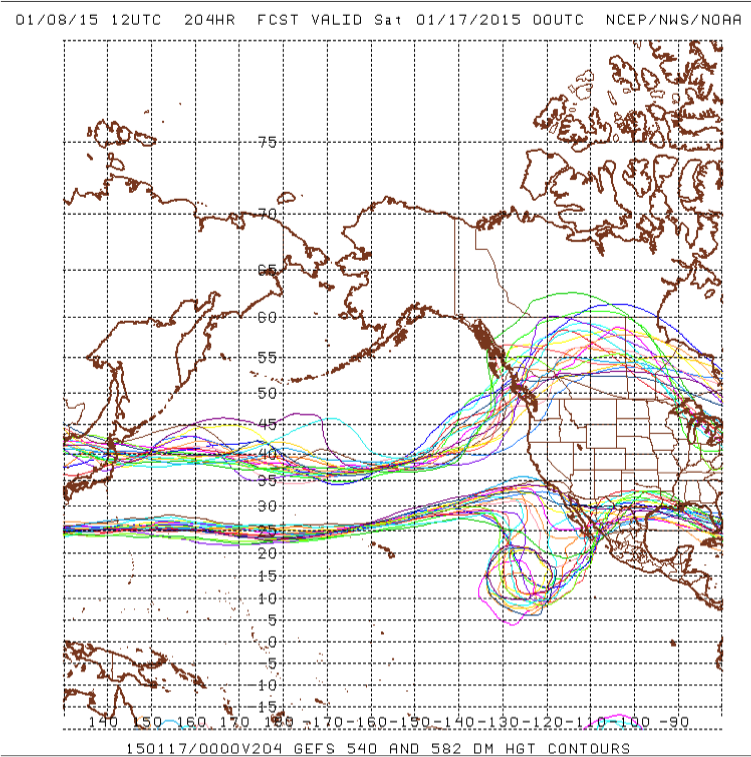 The daily PNA pattern from September 2014 to present, including a 7-day model projection set. Courtesy of the NOAA Climate Prediction Center.